And so on to Paris part two : where we stayed, where we shopped and where we enjoyed our departing Sunday brunch. In days gone by – before children and when I had a proper job – we always stayed in a friend’s little appartment in Montmartre whether I was there for work or play. We called it the Pigeon House, simply because it was right at the very top of the building where the pigeons of Montmartre perched and preyed. It has since been sold to new owners so we decided that rather than staying in a big, impersonal chain hotel or a very lovely but very pricey boutique hotel, we’d chance a B&B and hope for some Parisian hospitality. Through the powers of Google and various blog reviews, I came across Sourire De Montmartre. A family owned, 5 bedroom B&B in the heart of Montmartre on Rue De Mont Cenis, just a few minutes walk from the Metro and within a 10 minute bracing accent of the Sacre Coeur. It was the ideal mix between hotel and home. No awkward late night conversations with the owners and no silly hotel added extras or noisy neighbours to navigate. The 5 story house is scattered with bedrooms and en-suites on each level with a sitting room and kitchen at the very top where breakfast is served – although we didn’t actually make it on either morning. We stayed in the Josephine room which was beautifully furnished with family antiques and complete with cast iron bath under the bedroom window. Plus, amongst all the french finery, was a brand spanking new iMac to use and peruse as we wished. Clever people. When it comes to shopping, I’m not a huge fan, which is odd for someone who loves clothes, things and most forms of purchasing. Fashiony shops annoy me a bit, or maybe it’s just the other shoppers who annoy me, I’m not sure but either way it’s not my favourite thing to do and so I don’t. 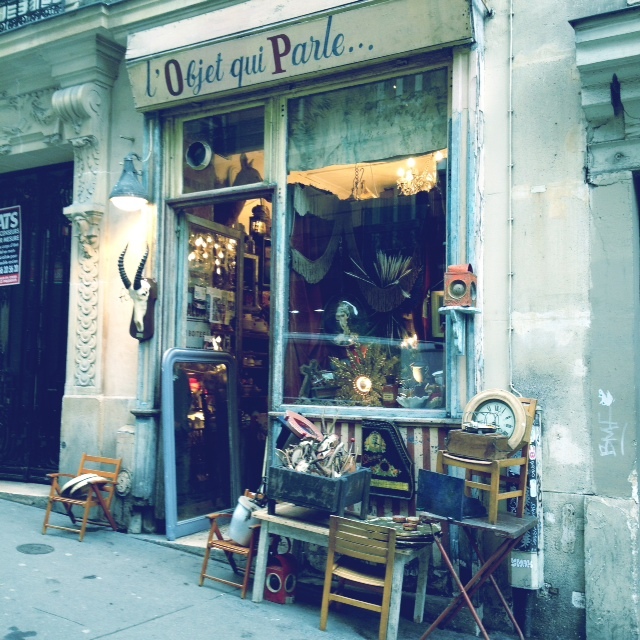 I do, however love a junk or curiosity shop and Paris has some of the very best. You have to be a bit careful not to be sucked in to buying over priced junk just because it looks pretty in the display. Here are two places to make my point, the first is the pretty one which can easily trip you up and the other is the real deal – or at least I think so. If we’re completely honest you’re not really going to find a real life junk bargain in a city like Paris unless of course your my husband who finds all kinds of treasure on street corners. More about that later. Au Petit Bonheur La Chance : a veritable haven for treasure and peculiar things but very very pricey. On first glance we thought we’d found the best shop in the world and it really is a wonderful place to look..and knock things over…but you could find pretty much everything in here on ebay or in a car boot sale if you looked hard enough. Saying this, I did buy a wire egg basket, one which stays flat until you add something weighty, but only because I’ve been wanting one for ages and never found the right one, until now. Au Petit Bonheur is part of the Village St Paul which is a well loved collection of shops and stalls all selling antiques and bric a brac. Situated in the cobbled streets of the Marais district, it’s a very acceptable way to spend a hour or two and well worth the visit. 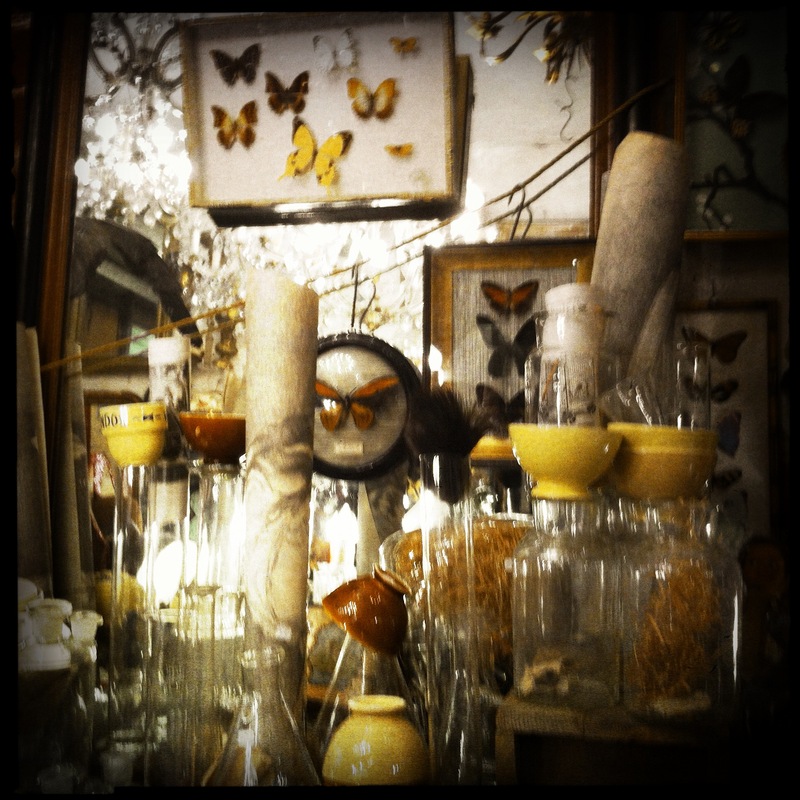 So on to our favourite shop in Paris, L’Objet Qui Parle or as we call it, the “Drunk Shop”. We discovered it a few years ago when we first stayed in Montmartre, tucked away on a hilly side street and owned by a charming man who – as all good French men do – enjoys a glass or three on a lunch time and so is much more prone to haggling if you visit mid afternoon. 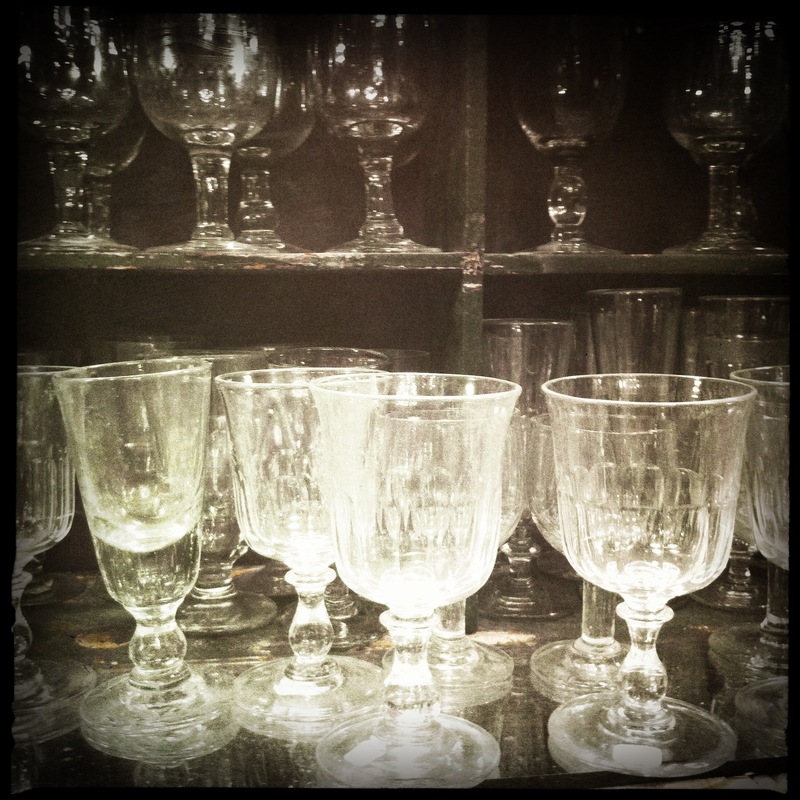 We have found some of our most loved and well used treasure in this little shop. From full dinner sets and silverware to desert bowls and my very favourite butter dish (which is actually a soap dish but who cares), all have hailed from the drunk shop and it’s our first port of call whenever we visit. This time we came home with 2 yellow Viandox coffee cups and the most wonderful antique coat hook to hang on our bedroom door. But the find of the weekend – or so says my husband – was a metre long, framed jigsaw puzzle of a quintessential French chateau which had been rather sadly discarded in a pile of rubbish on a street corner. He pounced on it as if it were gold and almost skipped off down the street to find a black sack in which to carry it. So that will grace the wall of the downstairs bathroom alongside other visual treats such as a Johnny Halliday needlepoint and a poster from a (legal) midget bull fight. Beauty is in the eye of the beholder after all. I’ll save our departing brunch for tomorrow’s post. It may get lost amongst all this and that would be a shame as it really was the perfect end to a very lovely weekend.